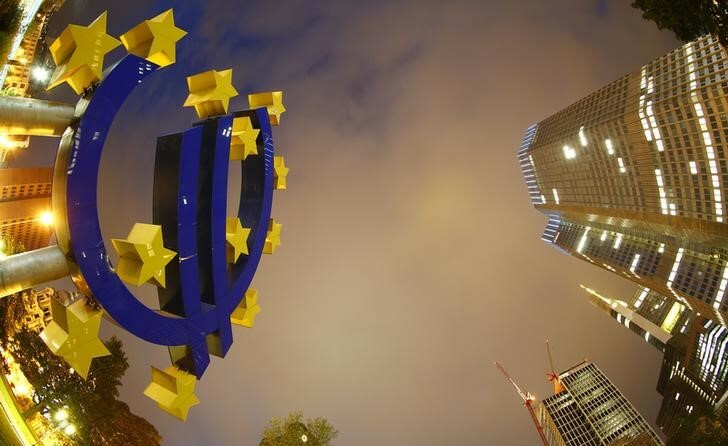 FRANKFURT (Reuters) – Euro zone prices are expected to continue growing at 1.7 percent per year until 2020 despite weaker underlying inflation and economic growth, a European Central Bank survey showed on Friday. The ECB confirmed a day earlier plans to wind down its 2.6 trillion euro ($2.96 trillion) stimulus program at the end of this year and raise interest rates sometime after next summer because it still sees inflation holding up despite uncertainties around growth. Its latest Survey of Professional Forecasters on Friday backed up that line of thought, with unchanged expectations for headline inflation for this year and the next two, at 1.7 percent, and in the longer term at 1.9 percent. But the forecasters polled by the ECB cut their estimates for core inflation, which strips out the more volatile energy and food prices, and economic growth for this year and the next. “Respondents typically attributed their revisions to external factors such as higher energy prices weighing on disposable income, with many also noting … some dampening impact on exports and investment due to increased uncertainty surrounding the outlook for world trade,” the ECB said. The euro zone’s central bank targets a headline inflation rate “below, but close to 2 percent” over the medium term. In its survey, the ECB also noted that growth in core prices was still accelerating, albeit now 10 basis points more slowly at 1.2 percent this year and 1.5 percent the next. underpinned by a pick-up in annual growth in compensation per employee, which was expected to increase to 2.3 percent by 2020,” the central bank said.